April 3, 2019 VNNC President George Thomas met with the artist who will paint the mural in front of LAPD Van Nuys Division, as well as Captain Hearn and the Executive Director of the 501c3 overseeing it all. As we are finishing the renderings, we wanted to share with you one of the final proposals. 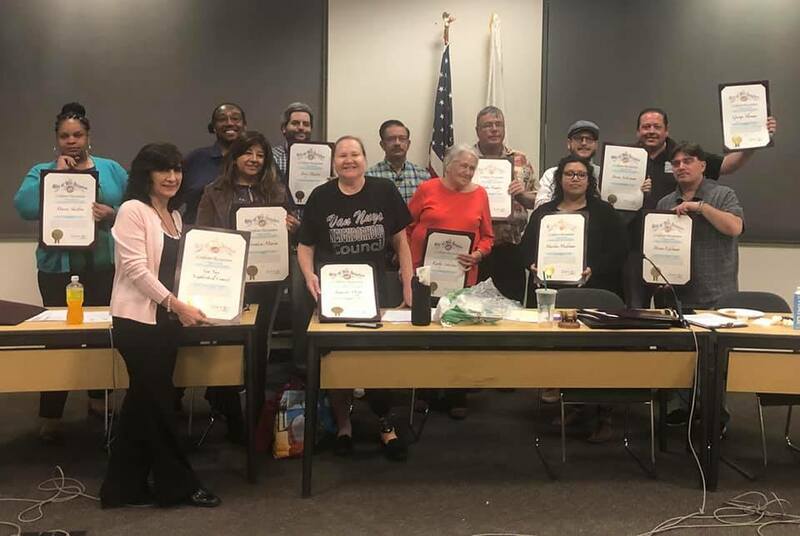 This is an exciting time for Van Nuys and our surrounding communities as our local government works to bring decision makers together to bring about the betterment of Van Nuys. And let this be the beginning of the transformation of the Civic Center. Next up is changing the pergola into a children’s playground. Then we will seek to bring the Smithsonian Postal Museum to the old abandoned post office at 6200 Van Nuys Boulevard. The Civic Center is a gem for the entire San Fernando Valley to enjoy. And has been ideal for any and all governmental and administrative purposes citizens have, but we are looking to go further than that. Our local council wants to turn the government center into the cultural capital of Los Angeles, with festivals and fairs in front of Van Nuys City Hall. So join us in supporting the mural project, and let us transform Van Nuys into the actual capital of Los Angeles and continue to have our #1 status as the best council in the land. This entry was posted in Art on April 3, 2019 by Editor. LOS ANGELES (March 14, 2019) – Record rainfall provided relief to drought-thirsty Southern California but created havens for disease-spreading mosquitoes in people’s yards. Take advantage of this rainfall to find and remove all unused containers from around the home that may collect water and contribute to mosquito problems. Other common sources include plant saucers, buckets, tires, pet water bowls, recycling bins, trash cans, and even trash hidden in nearby bushes. While residents do their part to tackle the standing water left by the recent rains around their homes, vector control technicians are in the field monitoring disease activity and controlling mosquito populations throughout GLACVCD’s jurisdiction. For more information or to anonymously report green, unmaintained pools, please visit the District’s website at www.glacvcd.org. This entry was posted in Public service announcement on March 19, 2019 by Editor. LAPD Chief Moore has made it his goal to expand the capabilities of the LAPD by growing the number of community volunteers. 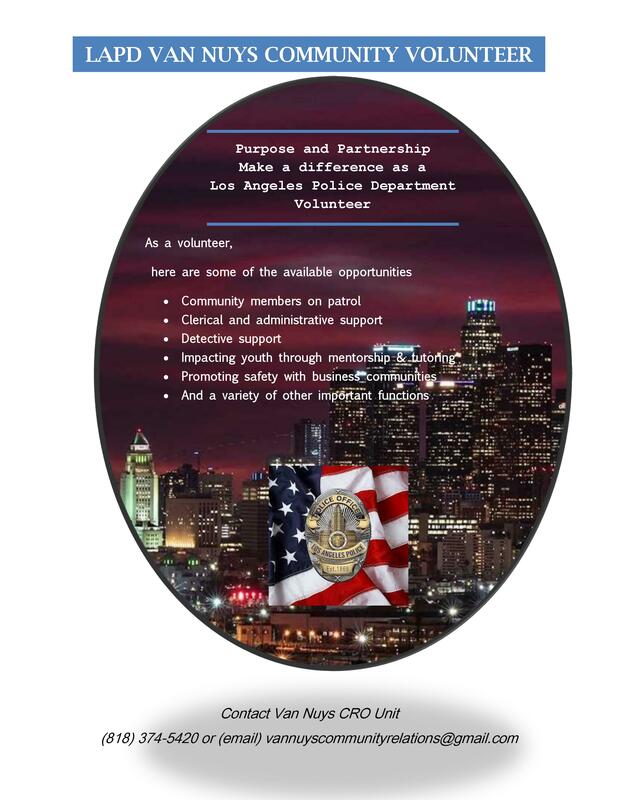 You can make a difference in reducing crime by volunteering with the LAPD. Through your service, officers are freed up to be on patrol and more. Find out what you can do! 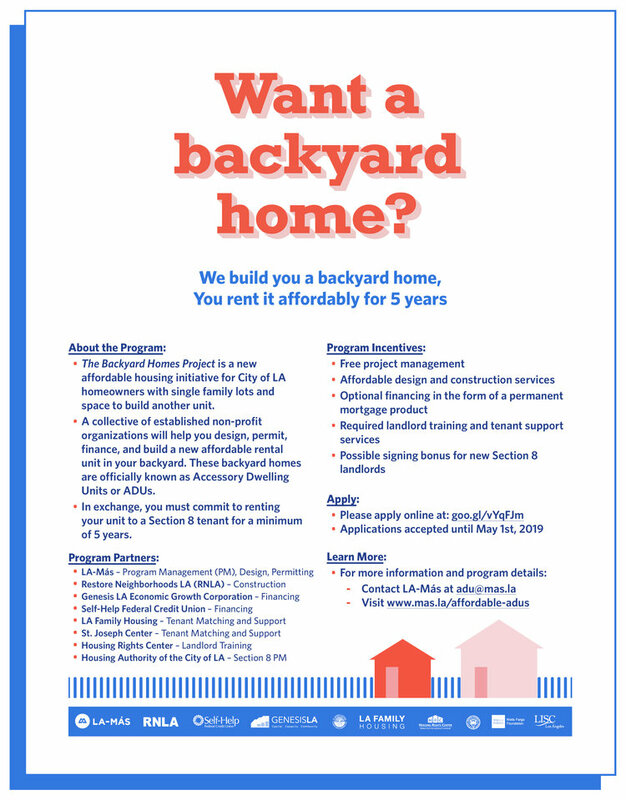 This entry was posted in Van Nuys Neighborhood Council (VNNC) on February 22, 2019 by Editor.